Funny story is that these nachos actually came around by accident. We originally were planning to recreate our favorite Tuna Watermelon Nachos from a local restaurant here, Ritas down at Folly Beach. I went to the store and of course they had no tuna and no watermelon, the main ingredients we needed. So, I quickly improvised and decided to substitute shrimp and pineapple. Let me tell you these nachos knocked our socks off. It is the perfect combo of flavors. 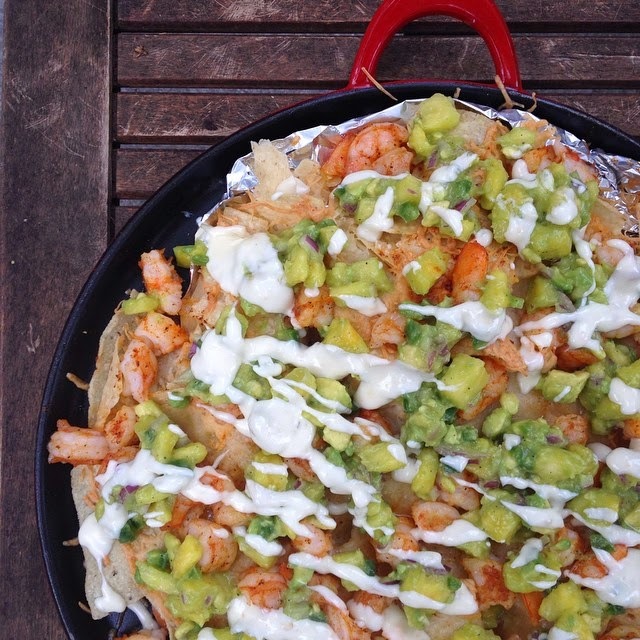 It is important to buy good white queso for these nachos. We bought the Ole brand in the refrigerator section. It is a little pricier than the Tositito brand but the quality is so much better. You could also buy a block of the Mexican queso cheese and melt it on the stove too. If you don't like Shrimp I think they also would be great with chicken instead. Hope you enjoy these nachos as much as we do! Peel, devein, and dice the shrimp. Place in a bowl and toss with the olive oil and Siracha hot sauce and lightly season with salt and pepper. Sautee the red onions in olive oil for about 5 mins just until cooked slightly. In a bowl mix the pineapple, avocado, sauteed onion, and jalapenos. Season with salt and pepper. Heat your queso in a skillet until melted. Place tortilla chips in a single layer on a baking sheet and bake at 350 degrees for about 5-10 mins just to heat the chips. While the chips are baking Sautee the Shrimp in the same pan you cooked the onions in about 3-4 minutes until the Shrimp are pink and cooked. Remove Chips from oven and drizzle Queso all over. Then add the Shrimp and Pineapple Avocado Relish. Sprinkle with fresh Cilantro and your favorite hot sauce and Enjoy! These sound amazing. I will be making them very soon! And I need to get out to ritas to try the tuna watermelon nachos. Yum! These look insane! If these were invented by pure accident, you are a culinary genius! YUM!!!! 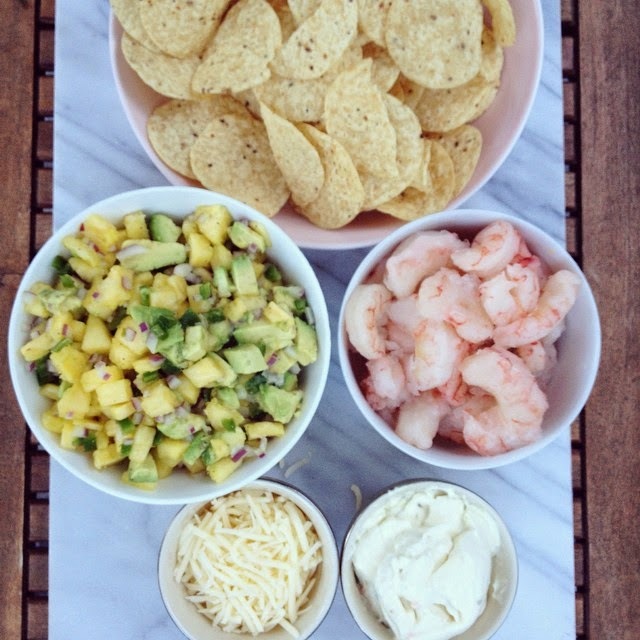 I love shrimp and pineapple and would never thought to put it on nachos. This looks so doable for me to try too. Yum!!!! Cannot wait to try these!!! Looks delicious- can't wait to try on nice spring night! Looks delicious; can't wait to make it! You need to add a "Pin" button to make it easier for us to share your recipes! Ok, these look amazing! I am adding them to my list of things to make next week. Great creation! I can't wait to try these this weekend! Thanks for the yummy recipe. This sounds soooo very good!!! Can't wait to make it this weekend! Oh my gosh, yum! A combo of all of my favorite ingredients! This looks SO SO good!! Great tip about the queso!! Can't wait to try! Mmmm!! These sound beyond delicious!! Totally making these stat...maybe tonight!! those look absolutely amazing! can't wait to try this out! Thanks for the recipe! No freaking way! This is the PERFECT spring/summer food and I am bookmarking this page asap and trying it later this week. Yum! All of my favorites in a dish... I can't wait to try this!! Happy accidents in the kitchen always turn into the best meals! I had the Rita's nachos on NYE and you are right - they are amazing! Your recipe sounds like a great app to make when you have some friends over! This look delicious. I've just been snacking all day and could really go for a huge plate of these. The sound and look delish! Can't wait to try out this recipe!! My mouth is watering! Might have to make these for girls night this weekend! If you are want to have cheap omega watches and watches and don't have much time or are lazy to explore cheap christmas gifts from store to store then you can go online. Numerous online stores are there women rolex watches on internet that sells designer handbags and catier jewellery for women in India. Shopatmajorbrands is one such waterproof jackets online store where you will get online great collection of discount gucci handbags and watches for women. This online store gives you a chance to get chanel classic bag and watches for women from some top major brands in India.